When tantalising topiary turns to hedging horror! 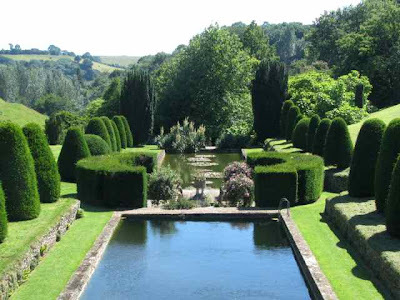 I've visited several gardens this month which are renowned for their topiary displays, starting with Mapperton House (above) and Athelhampton (below), but all are currently at risk from box blight or Phytophthora (Greek for 'plant destroyer') - a water-born fungus which kills yew hedges. 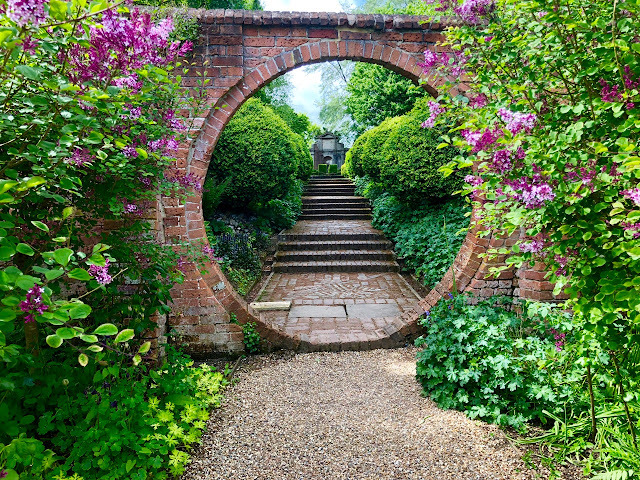 Sir Roy Strong completely changed his iconic garden at The Laskett after it had been hit by box blight and Westbury Park Garden in Gloucestershire (to be reviewed next week), is desperately looking for a cure for its yew hedges before it's too late! And the tragedy is that even Mapperton and Athelhampton looked as though they were in for a hard time beating these bugs. I'm not going to elaborate on the history of topiary here, because I've found a fascinating website which deals with all aspects of ornamental hedging - the Topiary Organisation - and will let you read for yourselves what is known about this ancient art. But what I do know is that I saw a huge number of immaculately clipped hedges in my travels last week, which prompted me to look further into topiary. 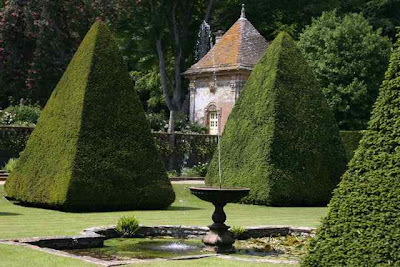 There are many stunning gardens in England where topiary is a primary reason to visit. 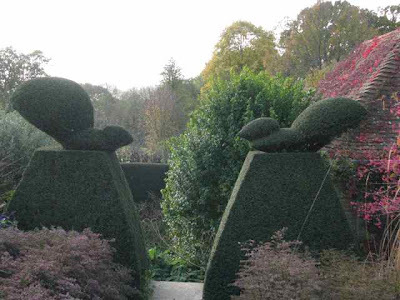 Personally, I cannot imagine the time and effort required to turn hedges into appealing shapes like the well-known squirrels at Great Dixter (above), or indeed the consummate clipping skills required to keep Veddw (below) looking so immaculate, but I am filled with admiration for those gardeners who offer such visual delights to their visitors. I have yet to hear of a gardener's spirit-level that guides the clippers, or an electric trimmer that cuts to a number 1 or 9 like a barber uses! 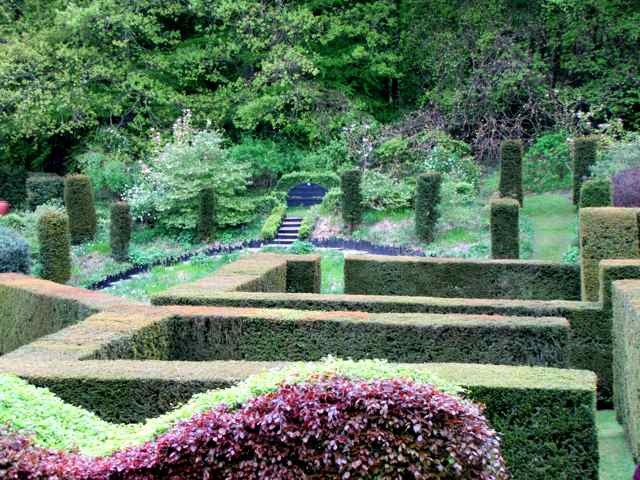 Let's just hope that someone finds a cure for these hedging horrors soon, because it would be a terrible shame to lose the topiary displays at these wonderful gardens. I'd just like to say that these are the gardens I've visited this month with extraordinary or interesting hedging .... there are many others throughout the UK that I'll be visiting later this summer .... so watch this space! I hope they do have a cure, what a terrible blight for these works of Art ! Such beautiful Topiary design. Love those two squirrels!!! 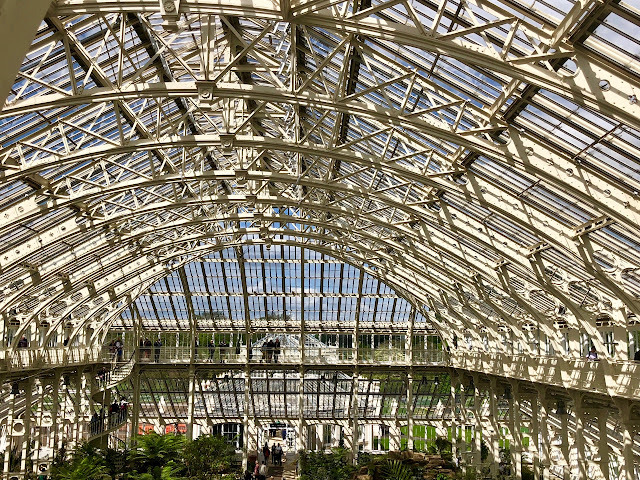 I hope they can find the cure for box blight or Phytophthora! pray for a hot summer: 33C should kill the spores. sorry to be so informational but i hope this helps...our plants have bald patches but they are recovering, thank goodness! It's a terrible blight to get on your hedges. I really do hope that a solution is found soon and that we don't lose these magnificent displays for good. You were at Athelhampton eh?...only a half hour from me, you should have popped in for tea!